A probe orbiting the solar system’s innermost planet is set to end its mission with a bang, leaving a mark on the surface of Mercury to be used by follow-up missions. The MESSENGER spacecraft should collide with the planet at the end of April. The 10-foot probe is scheduled to adjust its orbit on April 24 and impact the planetary surface on April 30. According to mission systems engineer Daniel O'Shaughnessy of John Hopkins University's Applied Physics Lab, the probe should hit the planet at a speed of 8,750 mph and leave a crater measuring approximately 52 feet across. Though the impact crater won’t be visible from the Earth, scientists hope that the joint European-Japanese BepiColombo mission, due to launch in 2017 and arrive in orbit around Mercury in 2024, will be able to investigate the crash site. “Having an impact crater, even a small one, whose origin date is precisely known, will be an important benchmark,” Sean Solomon, the mission's principal investigator and director of Columbia University's Lamont-Doherty Earth Observatory, told Space.com. 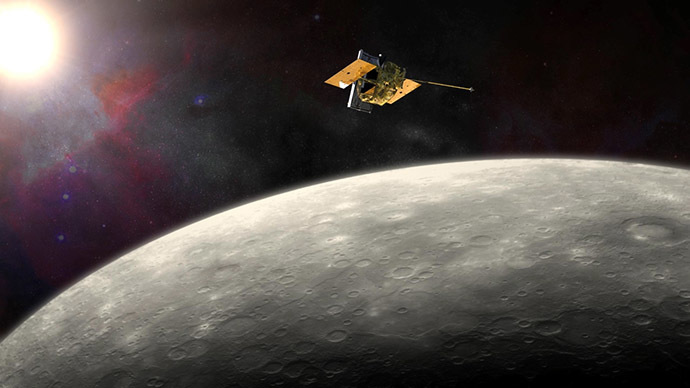 Launched in 2004, the $450 million “Mercury Surface, Space Environment, Geochemistry and Ranging” vessel (MESSENGER) arrived in the planet’s orbit in March 2011. It was the only probe ever to orbit Mercury and the second spacecraft to study Mercury up close, after NASA’s Mariner 10 flew by the planet three times in the 1970s. During its four-year mission, the probe completed over 4,100 orbits around the planet and relayed a wealth of information about Mercury. One of the major discoveries was finding organic compounds and water ice inside the shaded crater rims near the planet’s poles. MESSENGER also confirmed that Mercury does rotate, though very slowly: one ‘day’ on Mercury is two planetary years long.